A recent visit with my daughter Davida Amkraut in Beachwood, Ohio, coincides with a meeting of her book club. Like Davida, most of the women in the group are mothers and busy professionals in their early 40s. More than a dozen are present that evening in a member’s home, where they nestle on the couch, perch on beanbags or sprawl across the floor, sipping coffee or wine in easy intimacy. Their copies of Visible City by Tova Mirvis are marked with rainbow-colored Post-it notes. Amy Lipson, the facilitator for the evening, has prepared an insightful analysis of the novel about a bored, stay-at-home young wife and mother on the Upper West Side of Manhattan who amuses herself by spying on neighbors in her apartment building. “Does Nina really have to choose between motherhood and her career?” Lipson asks, triggering the first round of sensitive discussions. The women, reacting to that familiar dilemma, have ready challenges. “What about her husband, Jeremy—is he exempt from such a choice?” is a question that prompts a round of applause. The conversation continues until Shoshana Wexler starts to pass out a platter of cookies. As we drive home, I ask Lipson, a research project manager at Case Western Reserve University, how she found the time to prepare questions or analysis. She grins mischievously and flips her iPad to the Jewish Book Council’s website, which offers resources for dozens of titles, including Mirvis’s. There is a discussion with the author, a summary of the story and even recipes for the foods mentioned in the narrative, including those black-and-white cookies eaten with such gusto that evening. “Most of us check the JBC site for the books we discuss. It’s like CliffsNotes for facilitators,” my daughter adds. The Beachwood book group, like many such groups throughout the country, is part of a phenomenon that has revolutionized the reading experience. Irish artist John Butler Yeats once described poetry as “the social act of the solitary man,” but one could easily apply that description to reading itself. Book clubs, however, have transformed that solitary act into vibrant, interactive exchanges electric with the generous sharing of ideas and insights. ​Although these groups have long been popular, never before have they been as prevalent and eclectic as they are today. ​The New York Times estimates that five million Americans currently belong to one or more book clubs. The Jewish Book Council lists 1,400 clubs on its membership roster, and Miri Pomerantz Dauber, the council’s book club coordinator, says there are thousands more associated with synagogues, Jewish community centers and a host of other Jewish sponsoring organizations, including Hadassah. Given that each group averages 10 to 20 members, it is likely that tens of thousands of readers belong to Jewish book clubs. Jewish book groups span the generations. Collegians meet in Hillel houses on university campuses; Mommy and Me clubs cluster in playgrounds; young parents often schedule evening gatherings at homes or cafés; and retirees find new friends in senior villages as they begin a new chapter in their lives. There are women-only, coed or male-only groups; some boast participants of a particular age while others are multigenerational. This veritable explosion in book groups is attributed largely to Oprah Winfrey, who in 1996 introduced her eponymous book club. Other television hosts (from Jon Stewart and Charlie Rose to C-SPAN2’s Book TV) emulated Winfrey, and book clubs proliferated exponentially over the past few decades, sparking not only a national trend but also a tremendous boost for authors. Elie Wiesel’s Night , for instance, was an early Winfrey pick, catapulting what already had become a Jewish classic into mainstream American life. Publishers, in turn, took note of the hike in sales of group selections and started catering to the needs and interests of book clubs by adding author interviews and discussion topics or questions to the back of books or on their websites. Hadassah’s involvement in the book club experience is strong, starting with the organization’s inception in 1912 as a study group and gaining momentum as the general trend grew. Dozens of chapters throughout the United States have long included a literary component in their regular programming. Typical of such groups is the Diablo Valley Chapter in the San Francisco Bay Area, which has been meeting regularly to discuss its favorite literary finds for more than 50 years. Longtime member Joyce Ellenberg, 78, a former college administrator who chairs the group, says she “was drawn to Hadassah as a young mother because its literary enterprise offered interesting discussions—and babysitting.” Babysitting has vanished due to the changing demographic—today’s participants range in age from their 50s to their 80s—but the club remains a magnet for many women. Monthly meetings (usually nine or 10 times a year) attract 20 to 22 participants, with a mailing list of over 100. A core leadership circle of 15 women meets during the summer to choose the selections for the year, with titles limited to Jewish themes. Jewish authors are considered only if their work meets the criteria of substantive Jewish interest. Among the titles the group read this year were Notorious RBG: The Life and Times of Ruth Bader Ginsburg by Irin Carmon and Shana Knizhnik; The Marriage of Opposites by Alice Hoffman; and The Bridge Ladies: A Memoir by Betsy Lerner. Member facilitators lead the group on a rotating basis, charged with keeping the discussion on track—not always easy given the boisterousness of the readers. Conservative Congregation B’nai Shalom in the nearby city of Walnut Creek, Calif., has extended hospitality to the Hadassah club for many decades, even providing the requisite coffee and pastries. “Our meetings are exciting. Everyone has something to say and, although ideas vary, we agree to disagree,” Ellenberg says. She notes that one of her clubs began “as a group of like-minded readers who loved books and learning, Jewish learning in particular.” As years passed and members of the initial group relocated, their meetings grew more sporadic. “In a determined effort not to lose touch, we made a commitment to meet regularly—whether in the city or the suburbs—and continue our terrific discussions of fiction and nonfiction books with a Jewish dimension,” Hurwitz says. The group most recently read what she called the “many-layered” Waking Lions by Ayelet Gundar-Goshen, which tells the story of an Israeli surgeon who kills an Eritrean immigrant in a hit-and-run accident; his wife is the detective sent to investigate. Her second book group, which grew out of her synagogue, the Orthodox Hebrew Institute of White Plains, includes a slightly younger set, with members ranging from their 50s to their 70s. One recent meeting focused on The Muralist , a novel by B.A. Shapiro about an American painter who vanished from New York City in the 1940s. The hostess, Audrey Reich, described her own work as an exhibiting artist whose mixed-media paintings are inspired by the link between nature and Jewish history. Reich also shared art books to illustrate the creative process. “Sharing her [artistic] experience deepened our knowledge and gave us greater understanding of our friend,” Hurwitz recalls. At their September meeting, the group discussed the nonfiction Identical Strangers: A Memoir of Twins Separated and Reunited , written by twins Elyse Schein and Paula Bernstein. Roz Knopf, 87, who lives in an enclave of Jewish retirees in Boynton Beach, Fla., is also in two book clubs. 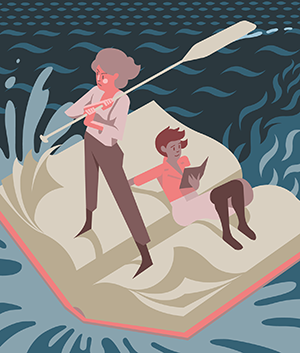 “Retirees have more time to devote to reading, and because they bring more life experience to the discussion, their contributions are especially enriching,” she says. “Our members, both men and women, share their own experiences and memories. They remember a world without Israel. Some of them fought in World War II. Some are Holocaust survivors.” In September, the group read A Land Remembered by Patrick D. Smith about early Florida settlers. Knopf also sees book clubs as a perfect venue for new and renewed relationships, especially in an area such as hers where every development has one or more book clubs. 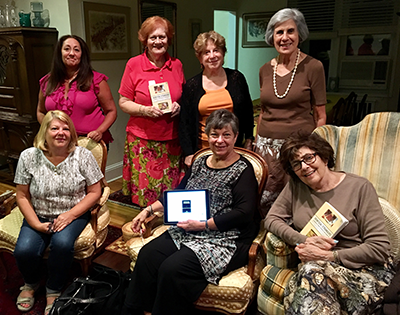 Her book group in Boynton Beach is not specifically Jewish, though many of the books they read feature Jewish subjects. She also leads a book group once a week for five weeks during the summer at Berkshire Hills Eisenberg, a Jewish summer camp in Copake, N.Y., which runs a separate program for adults over 55. This past summer, she focused on books that were made into movies, including The Lady in Gold: The Extraordinary Tale of Gustav Klimt’s Masterpiece, Portrait of Adele Bloch-Bauer by Anne-Marie O’Connor. Book clubs occasionally arrange Skype or conference calls with authors and sometimes even visits from the authors themselves. Every book club has its own personality and history. 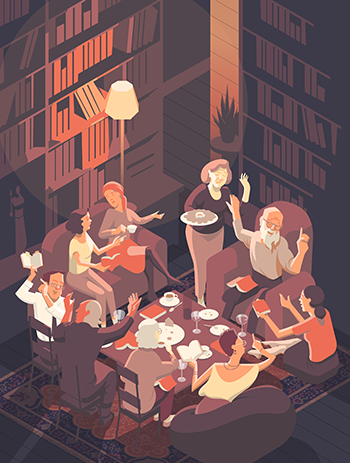 Jeanie Horowitz, 51, my London-based daughter, belongs to a book club of 35- to 60-year-olds that used to stipulate that the host prepare dinner related to the book under discussion. Jeanie once prepared a variety of kugels for a discussion of Michael Gold’s Jews Without Money , and her neighbor Deborah Virchis offered hummus and kebabs when the Israeli author David Grossman’s Someone to Run With was the choice. Full meals were ultimately abandoned, much to everyone’s relief due to the pressure involved. Vivian Brown, 78, once a member of the now defunct Beth Emeth Synagogue, a Conservative synagogue in Larchmont, N.Y., had belonged to its active book club. Over the years, the local library would stock multiple copies of the group’s selections and place them on a dedicated shelf. Some groups concentrate on a particular theme. A book club in Detroit comprising graduates of Zionist youth groups focuses on the ideology and history of Zionism. Arthur Herzberg’s The Zionist Idea engendered much discussion, and the group is now tackling Theodor Herzl’s much-neglected novel Old New Land (Altneuland) . Some groups focus only on works written in Hebrew, often reading the text aloud (dictionaries on hand) and trading comments in Hebrew. Naomi Fish of White Plains, N.Y., the daughter of a Hebraist, belongs to such a club that has been meeting for decades. Over the years, they’ve read Amos Oz, A.B. Yehoshua, Meir Shalev and David Grossman, among others. Beyond the obvious enjoyment essential to the Jewish book club experience, each meeting can be seen as the yearned-for lehrhaus envisioned by the great German Jewish thinker Franz Rosenzweig, in which mature students involve themselves in the adventure of Jewish learning. The increasing throng of Jewish book clubbers can be aptly described by the medieval sage Judah Ibn Tibbon, who advised readers to come together with “a willing heart and a listening ear.” Indeed, the people of the book have transitioned into the people of the book clubs—ever willing, always learning. Gloria Goldreich’s most recent novel, The Bridal Chair , is a popular choice for Jewish book clubs. The Jewish Book Council is a great source for how to start a book club. The site includes recommended reading lists and hosts live author chats. Goodreads offers a subsection of Jewish books and also hosts an online Jewish book group. 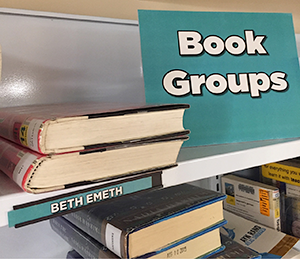 Jewish Women’s Archive lists books and hosts group discussions. St. Martin’s Press has an entire Jewish book website. You can also search Amazon.com for Jewish books, Jewish best sellers or specific Jewish themes. it’s always interesting to see what’s being selected and discussed. Our book club started in 1979 spearheaded by a group of British immigrants in the Herzlia / Raanana area in Israel. We have maintained a fluctuating number of 12-15 members from England, Scotland, South Africa, the US, Guatemala, Australia and we read a varied diet of mainly non-fiction classics, current books, but also recently read and highly recommend Being Mortal by Dr. A. Gawande and Sapiens by Dr. Harari [for this we had a skype link in with one member who was in Maryland]. Early hosting was mainly nibbles, tea and cake, but we have evolved into a dairy meal with soup, wine, quiches, salads and desserts often themed to match the country of the book under discussion. It is a source of wonder and delight for us as we share books, family events and life together. Viva Books and continued exploration of knowledge. I would be pleased to conduct online interviews. Thank you for your consideration. Solomon the Accountant is a tender love story set in Toledo, Ohio, in the 1950s. Solomon is a rather nebbishy fellow who falls in love with the beautiful, newly widowed Molly. He is painfully aware of her recent loss, yet she becomes the focal point of his life. He hopes that someday – regardless of how long he has to wait – the broken wings of her spirit will mend and she will soar toward a new future with him. While Solomon wrestles with his feelings for Molly, she is dealing with her own emotional issues. Facing life after the death of her beloved husband less than a year after they stood under the chuppah (wedding canopy) seems almost incomprehensible to the young widow. In addition to portraying a touching love story, the author beautifully recreates a bygone era – a time when a silk tie cost $1.60, a “comfortable house in a good neighborhood” could be purchased for $12,000, and nice Jewish boys still nervously asked the father for his daughter’s hand in marriage. Krauss, a writer and professional mediator, probes gently into the emotional psyche, exploring with clarity the crushing loss of death, the tenuous struggles to begin anew, the joys and complications of relationships, and the wonder of newfound love.